Lets end the year with great food, and happy bellies shall we? I am a big believer in good food for the end of the year festivities and Christmas celebrations. With so much going on around the holidays, its nice to have a bite to eat that you can sit and chill with, like an empanada. Literally you have a pocket of amazing food in your hand, contained, it’s not going anywhere except your mouth. 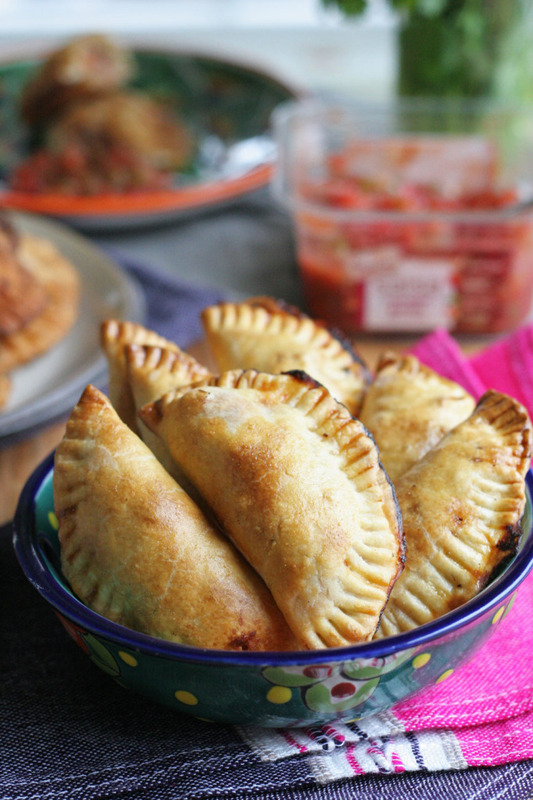 Chicken Salsa Empanadas is the perfect vessel for some really good stuff. We tend to have low key New Years, at home, good food, family and friends. This year is no different, and we always have really good food for New Years Eve and day of. Even if you have a huge party, quiet times, and maybe watch football all day, this is the best appetizer you could serve you and your guests. 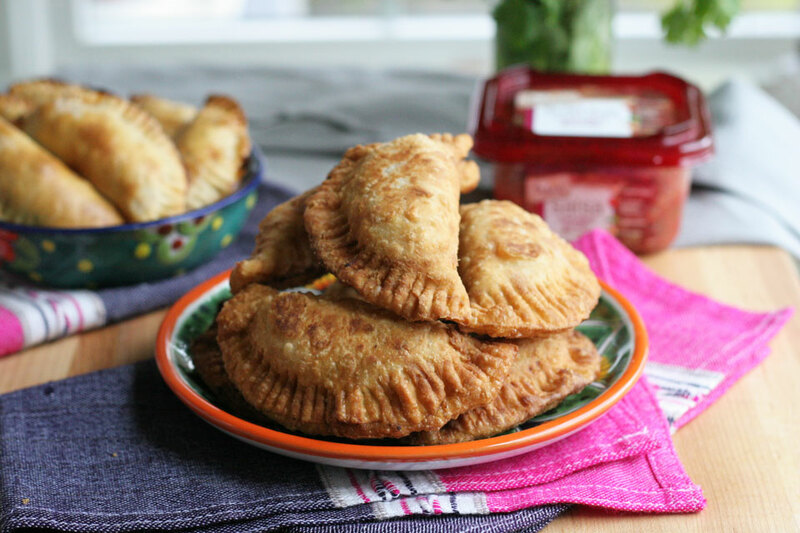 I am into so many traditional meals like paella for the main course, but we need to nibble before dinner, and emapanadas are where it’s at for the appetizer. You can even make it easier by buying a high quality rotisserie chicken, and delicious salsa, like Sabra, to make these a quick meal. I buy organic, free range, no hormones rotisserie chicken when I am taking the easy route. I feel better about my choice when I decide to be on the lazy/easier side of cooking and buy a high quality protein. I feel the same way about my salsas and Sabra is my go to company. 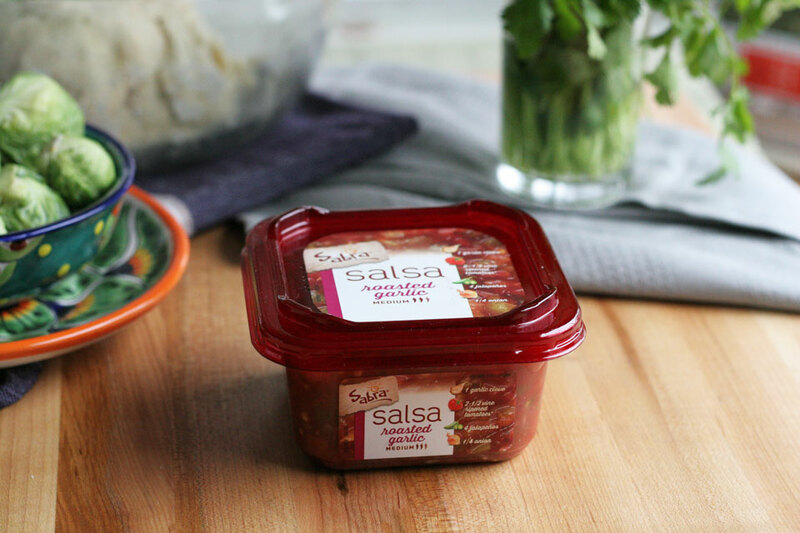 They are thoughtful in their salsa preparations from seed to harvest to salsa, so it’s no surprise this Latina goes for Sabra salsa. It’s easy enough to make dough by hand and stuff it with any flavor salsa, and chicken! The cool part is, you can freeze the empanadas uncooked for later meals. Think pre-made freezer meals, not store bought! I love doing that for when I know I’ll be traveling a lot or super busy with work. This year is no different, make life a bit easier. And these are tasty easy morsels of goodness. Grapeseed oil for frying, optional. As you can bake these as well. 1. In a large bowl add flour, and salt, whisk to combine. Add butter, wand water, using your hands, mix the dough until butter in incorporated. Place a towel over the dough and allow to rest 30 minutes. While dough is resting work on filling. 2. Place salsa, chicken, and yam into a bowl, mix to combine. 3. 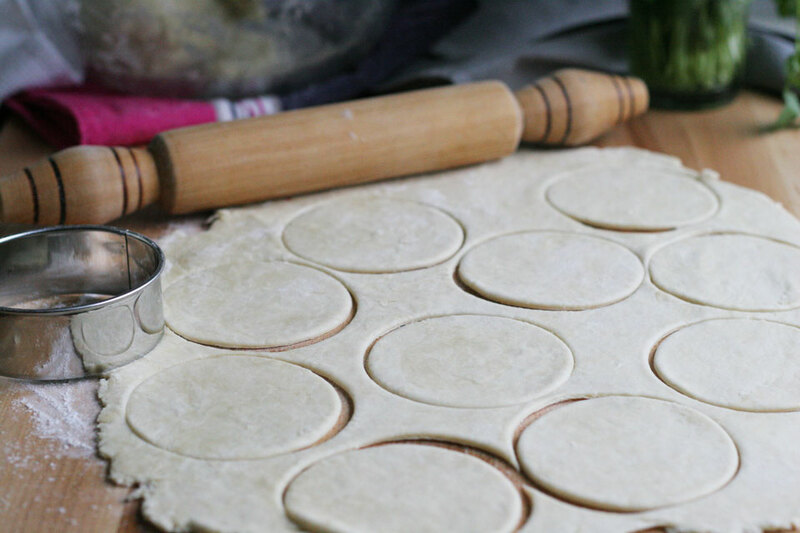 Remove dough from bowl, using a rolling pin, roll out to 1/4 inch thickness. Using a round 4-5 inch dough cutter, bowl, glass, or whatever you have on hand, cut into 20 pieces. 4. Place 1 tablespoon of salsa chicken filling into center of dough round. Brush egg wash around edges, fold over, and crimp using a fork. Place on a parchment lined baking sheet. Place in oven for 45 minutes or until golden brown. Frying: Add grapeseed oil about 2 inches to a 10 inch skillet over medium high heat. Once oil is hot, test by dipping edge of empanada, if hot enough, it will sizzle. Add 3-4 empanadas at a time, fry for 3-4 minutes on each side. Remove using a slotted spoon or spider. Place on paper towel lined plate. Serve immediately with more salsa! Just about anything wrapped in pastry is a win in my book! I especially love savory little bites like this – they are equally perfect for a laid back game-day or a fancy soiree. Delicious! I need to find that roasted garlic salsa! I LOVE empanadas! These look great! I usually buy the frozen empanada dough but probably need to start making homemade. I’m sure it’s a lot better! If you a little extra time, it’s so worth it! 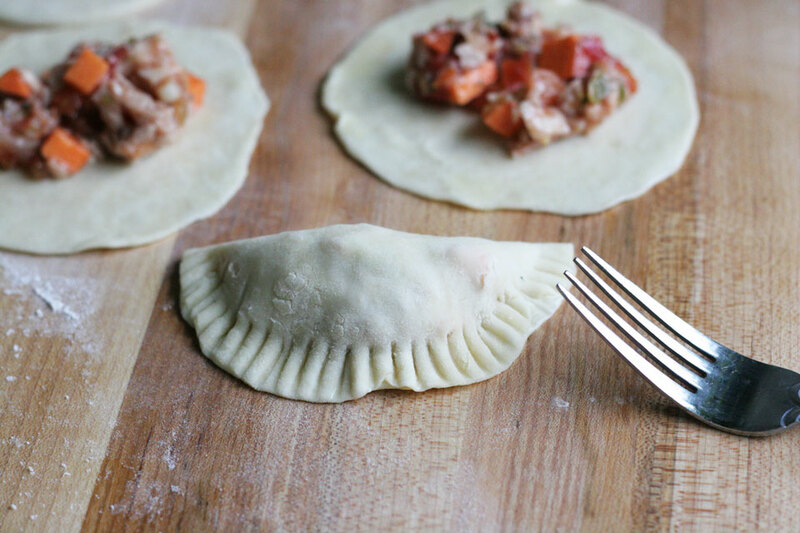 Love the idea of homemade empanada dough – I’ve only used the kind you buy in the refrigerator section of the grocery. Can’t wait to try this. Hand food indeed is so good, I agree! Thank you, and Happy New Year sweets!